"Do not run a job in a job." Director Gary Ross does his best Steven Soderbergh—a close friend of his, the director of the Ocean's Eleven trilogy that loosely remade the original 1960 Rat Pack film, and a producer here—impression in the all-female led Ocean's Eight (as the title appears in the film) heist caper film. It's a worthy yet somehow too conventional a spin-off of the utterly watchable 2001 heist comedy. A very loose Sandra Bullock stars as Danny Ocean's estranged but equally talented non-law abiding sister, Debbie. George Clooney does not appear, but his presence looms large over the whole film and Debbie's motivations in an odd (somewhat obtrusive) way. The magical Cate Blanchett and her insanely decorative wardrobe are so effortlessly cool and flawlessly captivating. Bullock and Blanchett as a buddy pairing are such a dynamic couple while their faux, playful couple chemistry leaves something to be desired in its ambiguity despite all the fun. Ross and co-writer Olivia Milch's more efficient script switches Las Vegas' casinos for New York City's Met Gala and wastes no time in getting to the heist. That's unfortunate since the Ocean's films derive so much pleasure from the random moments of its charismatic characters bonding, interacting, or bickering outside the settings of their crimes. However, the use of more female-centric themes, environments, and plot points are refreshing and make the whole endeavour much more thoughtfully realized. Doing a full-on comedy schtick, the misunderstood Anne Hathaway playing a flighty, egotistical actress is luminous riffing on her own public perceptions and the artificial celebrity persona that was unfairly grafted onto her in the press. She essentially plays the insincere public figure that was so unfairly grafted onto her for delightful results. Sarah Paulson is charming as the workhorse of the group playing a suburban housewife with a history of scheming. A mostly underdressed Rihanna gets a lot of understated shine as a laidback hacker before unleashing her full appeal. Helena Bonham Carter sporting an Irish accent for no reason hams it up amusingly as a disgraced fashion designer. Rounding out the cast, Mindy Kaling and Awkwafina get small moments of comedic humour but aren't much of a presence outside the mechanics of the heist. I wanted more of their character hijinx and natural comedic flair. The most annoying part of the film's very straightforward plot is Debbie's quest for vengeance against the ex-boyfriend (Richard Armitage) who sent her to jail. Where Danny justified his heist in Eleven through his deep love of his ex-wife Tess (Julia Roberts), Debbie does the very opposite which is a kind of a bad look for the gender-reversed roles. The lack of bite or outward conflict seems glaring as there's also no real villain unlike Andy Garcia's Benedict in the original. Somehow, all the glamour of one of the world's most exclusive social events doesn't entirely translate on-screen, whereas Vegas feels so naturally cinematic with all of its inherent glitz and artificiality. 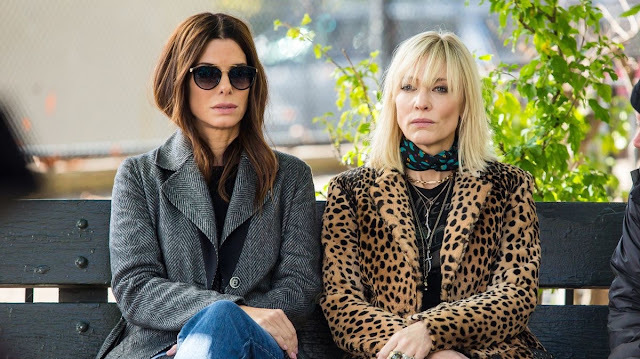 Ocean's 8's greatest flaw is its meticulous flawlessness. It's a perfectly entertaining caper heist comedy competently directed yet lacks the fun and flow of its predecessor despite a stellar cast and stripped down story comparatively. It's just not as much fun or as good as it should be given all the parts and talent. The film clearly misses Soderbergh's seamless touch and confidence as a visual filmmaker and effortless blocking of characters and action.